I met someone at the PASS Summit this year who really pushed past her fears to meet a lot of people and make an impact. Andrea Allred. As a tribute to her bravery, I have submitted a guest post over on her blog specifically about dealing with your fears and not letting them stand in your way. Swing over to her blog (www.royalsql.com) and check out her awesome posts. I recently ran into an issue where the production VM template (containing Enterprise Edition of SQL Server 2008 R2) was used to deploy new SQL Server VMs for Engineering development (and thus should be the Developer Edition of SQL Server 2008 R2). This is not a supported path by Microsoft, thus a more creative approach needs to be taken in order to accomplish this task. I started by verifying the integrity (DBCC CHECKDB) and creating fresh backups of all DBs (including system DBs). o I used sp_help_revlogin, which works great for recreating the logins with the existing password, but unfortunately it does not script out the role membership (I scripted that manually). For those that are curious, the password is hashed in the script, so you can’t use sp_help_revlogin to look up/hack a login password. o Restoring the MSDB database should recover your SSIS Packages, but you may want to export them through Integration Services, just to be certain to preserve your hard work. Note: The build number must match exactly for this process to succeed. I was able to apply SP2 for SQL 2008 R2 (SP2 for SQL 2008 R2 results in build 4000 - 10.50.4000) before starting the process to make things easier after the install (then I don't have to track down what Cumulative Updates and/or Security Updates are applied to the current instance of SQL). Next, I stopped all SQL Server services and created a folder on the Desktop (called System DBs). I copied in the MDF and LDF files for the Master, MSDB, and Model (as we had customized Model) databases for the Enterprise Edition installation of SQL Server. With all the ground work in place, I then uninstalled all MSSQLSERVER features to remove Enterprise Edition (I grabbed a screen shot of the Select Features screen while I was uninstalling so that I could be certain to install the correct features when reinstalling). Uninstalling the Shared Features is not necessary, and will only make the process take longer. I then installed Standard Edition to the same folder as the previous (Enterprise) edition. I also applied the correct service pack to SQL Server (to bring the build up to the same as the previous Edition). Installing SQL Server to the same folder will overwrite all existing System DBs, but your User DBs will remain unscathed. At this point in the process is where I tried to add some awesome sauce. Instead of attempting to restore master (which can be a royal pain), model, and msdb; I merely stopped all SQL services. I then created a new folder on the Desktop (called New System DBs) and moved out the current MDF and LDF files for the Master, Model and MSDB databases. Then I copied in the MDF and LDF files for the previous installation of the Master, Model and MSDB databases and started the SQL services again. 4. Make note of the current Service Pack for SQL Server and the path(s) that SQL Server is installed to. I hope this process helps you if you find yourself in the same situation. Thursday is Women In Technology day at the PASS Summit. This year I was able to wear a kilt to show support for the fairer gender. The keynote started off with an overall PASS status update. Emphasis was given to the community, and how you can do much in the community without huge financial resources at your disposal. Tomas LaRock stepped up and announced some additional awards being added to the PASS lineup. Jen Stirrup was awarded the PASSion award, and she totally deserves it for her contributions to recognizing Women In Technology. Quentin Clarke (Microsoft Corporate Vice President, Database Systems Group) spoke on data analysis and how businesses can use that data to market their business. This poses new challenges and problems when trying to analyze that data in a more real-time manner. A large package shipping company was mentioned, and the analytics that they perform to generate additional revenue by analyzing the contents of their data warehouse. The data life-cycle was discussed and demoed. Effective use of the data requires analysis and collaboration between multiple departments/companies to take full advantage of the advantages that proper analysis can reap. Analyzing data from a movie theater company's data warehouse was demoed (utilizing PowerView). There was a mixed response as most DBAs and straight up developers were not incredibly impressed or interested. Karen Lopez tweeted that big data might not be interesting, but it is inevitable and that we need to at least be aware of the technology and how to work with it. As a DBA, I'm likely not going to be using Excel very frequently. If the demos could cover more information as to how things work under-the-hood, a lot more interest would be garnished. I think that's why Dr. DeWitt was so insanely popular last year. The ability to add Azure as an Availability Replica was an awesome feature that was shown off toward the end of the demo. The demo ended on a high note as more functions and features were demoed. I'm really looking forward to Dr. DeWitt's session tomorrow. What a brilliant man! Bill Graziano opened the day with a PASS status update and Summit overview. Connect, Share, and Learn is still the mantra of PASS. Community is of critical importance. No one can know everything, but together we can accomplish anything. Bill recognized many of the community volunteers. It was a great opportunity to realize and acknowledge the value of those that contribute to the community. A new user group website was announced with additional and more valuable tools. These tools are designed to ease chapter management and administration. As a chapter leader, this excites me greatly. A PASS BI conference in Chicago (at the Sheraton Chicago Hotel and Towers) was announced, April 10-12, 2013. The BI arena is growing rapidly and a dedicated conference is awesome. It's an exciting time to be involved in PASS. PASS is growing (over 127,000 members) and is becoming much more globally focused. International growth has been tremendous. 57 countries are represented and additional growth opportunities are actively being developed. Ted Summers (Corporate VP of Microsoft) presented the keynote. Microsoft is extremely excited about the release of SQL Server 2012. The release of SP1 for SQL Server 2012 was announced and was released today. I'm very excited about that as it addresses a performance issue that I had when testing SQL Server 2012. Big/non-relational data (including, but not limited to, Hadoop) is still a big focus for Microsoft. Data storage requirements are only going to continue to increase in the future, so dealing with larger and larger amounts of data will continue to garnish attention. In-memory technology was discussed and it was announced will be a feature in the next major version of SQL Server (codename: Hekaton). The technology was demoed and you can actually pin an entire table (including indexes and table structures) into RAM (the demo initially yielded a 5x gain in performance). You can also recompile SPROCs to run native in memory (in combination with in-memory configured for the table, this yielded nearly a 30x gain in performance in the demo). Included is a tool that examines performance and recommends tables and SPROCs for in memory optimization. No code or hardware changes were needed to reap huge benefits. Performance gains of an in memory column store index was also discussed. Heketon makes SQL incredibly fast ("wicked fast") and since it's merely an enhancement to SQL Server, if you know SQL Server, you know Heketon. Additional optimizations to the parallel data warehouse have yielded massive performance improvements in that arena as well. An updated query processor was announced. PolyBase handles queries from multiple sources, including local and cloud sources. This allows you to use standard T-SQL code to query Hadoop and other non-relational databases. You can even JOIN between relational and non-relational data. This will also be included in the next major version of SQL. BI enhancements were announced. Excel 2013 is now a complete BI tool. PowerView has been integrated into Excel to provide exceptional BI functionality. Full interactive maps were demoed directly within Excel. Overall, the keynote on Wednesday was very exciting for the SQL Server professional. I eagerly anticipate the next major release of SQL Server. 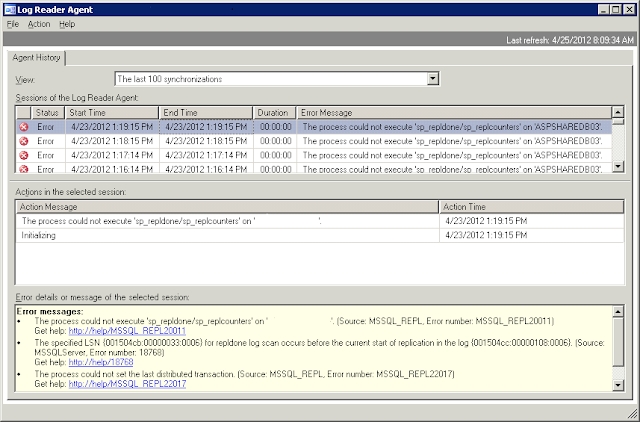 A tough lesson regarding why you should always keep the configured default Data and Log paths updated in SQL Server. At my company, our virtual infrastructure is growing and changing rapidly. As a result the configuration of our SQL Servers is changing also. This results in additional drives and drive letter changes for our SQL servers. Unfortunately, if the default Data and Log paths are not updated when the drive letters change, there will be errors after installing (or uninstalling) a Service Pack or Cumulative Update. The GUI portion of the install will complete successfully, but there are updates that occur on the initial service start after the GUI portion of the install is complete. One update that occurs that that initial service start is database upgrades. If your default paths for data and log files are not correct (in my case the drives referenced no longer existed), the upgrade of the master database will fail and the SQL Server service will crash. In a production setting, this can induce fear, panic, and mass hysteria (or at the very least mass Google searching, which is likely how you arrived at this page to begin with). However, the solution is pretty simple as the default paths are stored in the Windows registry. Once the paths are correct, the master database upgrade will complete successfully (as SQL Server will be able to create the temporary files in the default paths) and once all other system and user DBs are upgraded you should be back up and running. Note: The database upgrades will take some time if you have a lot of user DBs, but you can monitor the ERRORLOG to observe the progress. 2012-08-29 08:45:43.39 spid7s Error: 5133, Severity: 16, State: 1. 2012-08-29 08:45:43.39 spid7s Directory lookup for the file "G:\MSSQL\Data\temp_MS_AgentSigningCertificate_database.mdf" failed with the operating system error 3(The system cannot find the path specified.). 2012-08-29 08:45:43.39 spid7s Error: 1802, Severity: 16, State: 1. 2012-08-29 08:45:43.39 spid7s CREATE DATABASE failed. Some file names listed could not be created. Check related errors. 2012-08-29 08:45:43.39 spid7s Error: 912, Severity: 21, State: 2. 2012-08-29 08:45:43.39 spid7s Script level upgrade for database 'master' failed because upgrade step 'sqlagent100_msdb_upgrade.sql' encountered error 598, state 1, severity 25. This is a serious error condition which might interfere with regular operation and the database will be taken offline. If the error happened during upgrade of the 'master' database, it will prevent the entire SQL Server instance from starting. Examine the previous errorlog entries for errors, take the appropriate corrective actions and re-start the database so that the script upgrade steps run to completion. 2012-08-29 08:45:43.39 spid7s Error: 3417, Severity: 21, State: 3. 2012-08-29 08:45:43.39 spid7s Cannot recover the master database. SQL Server is unable to run. Restore master from a full backup, repair it, or rebuild it. For more information about how to rebuild the master database, see SQL Server Books Online. 2012-08-29 08:45:43.39 spid7s SQL Trace was stopped due to server shutdown. Trace ID = '1'. This is an informational message only; no user action is required. 2012-08-29 08:57:50.73 spid7s CREATE FILE encountered operating system error 3(The system cannot find the path specified.) while attempting to open or create the physical file 'F:\MSSQL\Logs\temp_MS_AgentSigningCertificate_database_log.LDF'. 2012-08-29 08:57:50.93 spid7s Error: 5123, Severity: 16, State: 1. 2012-08-29 08:57:50.93 spid7s CREATE FILE encountered operating system error 3(The system cannot find the path specified.) while attempting to open or create the physical file 'F:\MSSQL\Logs\temp_MS_AgentSigningCertificate_database_log.LDF'. 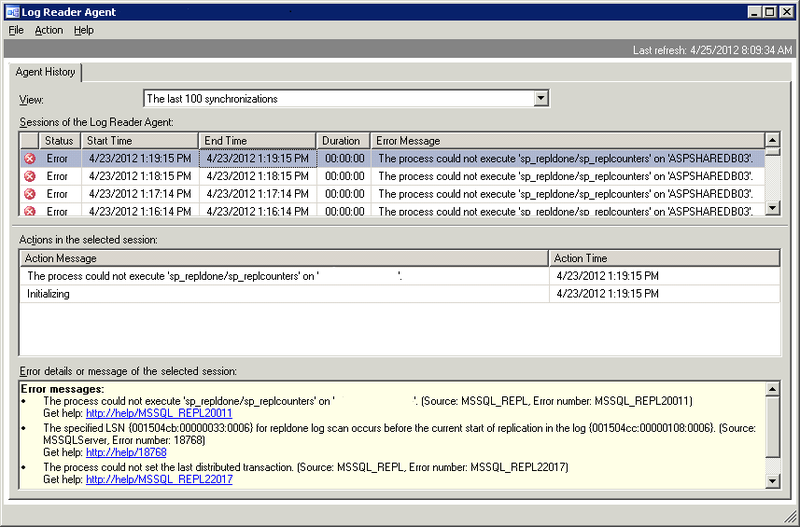 2012-08-29 08:57:50.93 spid7s Error: 1802, Severity: 16, State: 4. 2012-08-29 08:57:50.93 spid7s CREATE DATABASE failed. Some file names listed could not be created. Check related errors. 2012-08-29 08:57:50.93 spid7s Error: 912, Severity: 21, State: 2. 2012-08-29 08:57:50.93 spid7s Script level upgrade for database 'master' failed because upgrade step 'sqlagent100_msdb_upgrade.sql' encountered error 598, state 1, severity 25. This is a serious error condition which might interfere with regular operation and the database will be taken offline. If the error happened during upgrade of the 'master' database, it will prevent the entire SQL Server instance from starting. Examine the previous errorlog entries for errors, take the appropriate corrective actions and re-start the database so that the script upgrade steps run to completion. 2012-08-29 08:57:50.93 spid7s Error: 3417, Severity: 21, State: 3. 2012-08-29 08:57:50.93 spid7s Cannot recover the master database. SQL Server is unable to run. Restore master from a full backup, repair it, or rebuild it. For more information about how to rebuild the master database, see SQL Server Books Online. 2012-08-29 08:57:50.93 spid7s SQL Trace was stopped due to server shutdown. Trace ID = '1'. This is an informational message only; no user action is required. Recently, I needed to install the BCP utility on our job automation servers. These servers do not need the full suite of SQL Server Workstation Tools, just the BCP.exe command line utility. I found the following process worked quite well at only installing what was needed (thus saving around 1 GB of disk space by not installing the Workstation Tools). The following components need to be installed on a standalone server in order to get the BCP utility functioning. Since the servers I was dealing with were Windows Server 2003, I needed to install the Windows Installer 4.5. Newer versions of Windows Server (i.e. Windows Server 2008 R2) already have the newer Windows Installer. If installation of the Windows Installer is needed, a reboot will be required. Installing the Native Client and Command line utilities are as simple as just running the installers. A reboot is not required for either the Native Client or Command Line Utilities. That's it! Once the aforementioned components are installed, the command line BCP utility should work beautifully. Transactional Replication and nasty errors that cause out of sync publications. After much searching on the error, I came across several forum posts that indicated I was pretty well up a creek. I then found this post on SQLServerCentral. Hilary Cotter's response was the most beneficial for devising a recovery plan and Stephen Cassady's response helped me refine that plan. Hilary Cotter (Blog) is an expert when it comes to SQL replication. He certainly knows his stuff! Recovering from this issue involves several steps. For small databases or publications where the snapshot to reinitialize the publication will be small and push quickly, it's simplest and best to just reinitialize the entire publication and generate/push a new snapshot. This effectively tells SQL to restart replication NOW, thus ignoring all transactions that have occurred between the time of the failure and the time you run the command. The longer you wait to run this command, the more activity in the database that gets ignored, which likely results in more tables that fall out of sync. This error causes the Distribution Agent to fail, but there is a system profile for the Distribution Agent that you can select to bypass the data consistency errors. Validating the Subscription(s) is a fairly straightforward task. For my publications (~1,000 tables and DB was ~100GB) the validation process took about 20 minutes, but individual results will vary. -- This next line restricts results to the past 24 hours. Table 'MyTable' might be out of synchronization. Rowcounts (actual: %value, expected: %value). Checksum values (actual: -%value, expected: -%value). Make a list of all tables that are returned by the aforementioned script. Now the determination needs to be made as to the level of impact. The latter was the case in my scenario (about 100 out of 1,000 tables were out of sync, and the ~900 tables that were in sync included some very large tables). The reason for performing this manually is that sometimes when you select the Generate the new snapshot now option, it kicks off the Snapshot Agent before the reinitialization is complete which causes blocking, deadlocks and major performance issues. Once the center page has populated, expand each table published to determine if the table is filtered (i.e. not all columns in the table are published). Note: If you receive an error that the entire snapshot will be invalidated, close the Publication Properties window and try adding in a few tables at a time until all tables are selected. Once the snapshot has been delivered and replication has caught up on all queued transactions, perform the following to return replication to a normally running state. I hope this helps if you run into the same situation. I would like to especially thank Hilary Cotter for sharing his knowledge with the community as his forum and blog posts really helped me resolve the issue.